Many dinners for us start with a salad. I keep some key ingredients on hand—greens, carrots, tomatoes, celery and cucumbers. I also roast many others, such as eggplant, beets and red peppers. These will all keep a good week in the refrigerator. I also keep an assortment of cheeses as well—goat, parmesan and blue cheese, along with pine nuts and these rosemary pecans. Heat a non-stick skillet to medium heat, then add the butter. 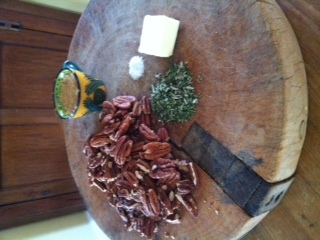 Add the pecans and then the rosemary and stir. cool on a glass plate, then store in an air-tight container. This entry was posted in Recipes and tagged Homemade, Recipe, Rosemary Pecans, Salad Dressing. Bookmark the permalink.